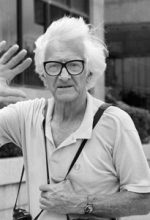 1923 Marc Riboud is born on June 24th at Saint-Genis-Laval, near Lyon, the fifth of a family of seven children. 1937 Marc Riboud takes his first photos at the World’s Fair in Paris. His father gives him the little Vest Pocket Kodak he used in the trenches during the First World War. An enlightened amateur, his father had also bought one of the first models of the Leica camera, which had already become a must for the great photo journalists of the 1930s. 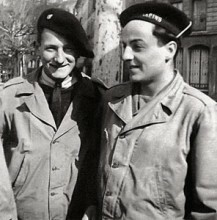 1943-1944 Marc Riboud joins the Resistance and participates in the battles of the Vercors before joining a mountain infantry regiment of the regular army. 1947 Photographers Robert Capa, Henri Cartier-Bresson, George Rodger and David Seymour found the Magnum agency. In contrast to agencies current at the time, where photographers draw a salary, they become “authors”, owners of their own negatives, organized in a cooperative responsible for the agency’s activities. The photographers produce “subjects” related to current political, economic and cultural stories in the news, which are then sold to magazines, the main disseminators of photos at this time. In 1949, industrialist Jean Prouvost creates the photo-illustrated newsmagazine Paris Match. Patterned after American magazines such as Life or Look, this weekly gives priority to images and becomes an essential circulation medium for the photographers. Before television comes to every home, the magazine press experiences its hour of glory. 1948-1951 After studies in engineering at the Ecole centrale de Lyon, Marc Riboud works in a factory at Villeurbanne. During a break taken to photograph the festival of Lyon, he decides to devote himself to photography rather than returning to the factory. 1952-1953 Marc Riboud moves to Paris, where he meets Henri Cartier-Bresson and Robert Capa who recruit him to join the Magnum agency after his first published photo, that of a painter on the Eiffel Tower. Like everyone who comes from the provinces, he initially takes many photos of Paris before leaving on his first journey to Yugoslavia in 1953, and then, at Robert Capa’s advice, spending a year in England in 1954. 1955-1957 Travelling by land, Marc Riboud crosses the Middle East and spends a year in India before arriving in China for a stay of several months. 1958 Covering stories in Indonesia and Japan, where Marc Riboud concentrates on photos of Japanese women. This is the subject of his first book, Women of Japan, with a text written by novelist Christine Arnothy. He then crosses Alaska in winter and travels to the United States and Mexico. Mao Tse-tung’s policy of collectivisation and the transfer of millions of peasants to public works sites diminish agricultural production to a level that is insufficient to feed the population. In three years, at least 30 million Chinese die in the ensuing famine. 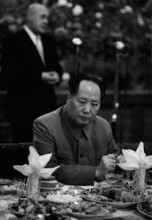 Mao Tse-tung is dismissed from his duties as President of the Republic but remains at the head of the Communist party. 1960-1963 Marc Riboud covers several stories in sub-Saharan Africa, in Ghana, Nigeria, and Guinea. After Ghana in 1956 and Guinea in 1957, the great majority of African countries obtain independence by peaceful means in 1960. Several great political figures, among them Léopold Sédar Senghor, Félix Houphouët-Boigny, Patrice Lumumba and Jomo Kenyatta, marked the end of the colonial era. 1962 Marc Riboud makes regular trips to Algeria. He covers the July 1st referendum and the independence celebrations and photographs Ahmed Ben Bella and Houari Boumediene, the political leaders who will run the country. Algeria achieves independence on July 5th, 1962, after eight years of murderous war on Algerian soil and profound divisions within French society. 1963 Prepares his first one man exhibition at the Art Institute of Chicago. Covering events in Cuba with journalist Jean Daniel, founder of Le Nouvel Observateur. They meet Fidel Castro and interview him in their hotel room. A few days later, Jean Daniel is present when Fidel Castro receives a phone call informing him of the assassination of American President John Kennedy at Dallas. October 1962 marked the beginning of the Cuban missile crisis, when the American administration spotted Russian nuclear missiles on the island of Cuba, pointed at United States territory. This was one of the last episodes of the Cold War that would soon be followed by a period of détente. 1965 Marc Riboud returns to China where he photographs the premise of the Cultural Revolution. 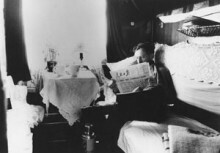 These photos are published in the international press and in his second book, The Three Banners of China. Exhibitions are presented at Asia House in New York, the Institute of Contemporary Art and the Photographer’s Gallery in London, and the Galerie Delpire in Paris. 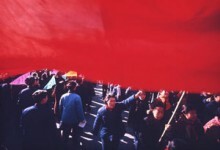 Calling upon young people for support, Mao Tse-tung launched the Cultural Revolution to consolidate his power. On his orders, the Red Guards destroy thousands of sculptures, temples, and everything that embodies traditional values. The cadres of the Party are subjected to a purge, the elites are persecuted, and the country is on the brink of civil war. Today we know that the Cultural Revolution was responsible for hundreds of thousands of deaths. 1967 In Washington, during a huge demonstration against the war in Vietnam, Marc Riboud photographs the young Jan Rose Kasmir. This image, often referred to as “Young Girl with a Flower”, would become an icon of peace. A year later, he will cover the events of May 1968 in Paris. Assignment in Moscow to cover the celebrations of the fiftieth anniversary of the October Revolution. The Vietnam War pitted the troops of North Vietnam, under the presidency of Ho Chi Minh, against the South Vietnamese army, backed up by the Americans. Beginning in 1961, the number of American troops sent to Vietnam steadily swells, up until the inception of peace negotiations in Paris in 1969. The war caused the death of several hundreds of thousands of soldiers and civilians. Increasingly unpopular in the United States, anti-war demonstrations multiply, but the conflict will end only with the victory of North Vietnam in 1975 and the ensuing reunification of the country. 1968-1969 Covering stories in North and South Vietnam, Marc Riboud’s articles about the destruction of the city of Hué and the daily life of troops on an American aircraft carrier are published in Le Monde and Paris Match. He returns to Vietnam in 1972 and again in 1976, where he photographs the forced re-education of South Vietnamese cadres, prisoners of the communist powers. 1971 Marc Riboud returns to China and travels to East Pakistan during the bloody battles that precede its independence under its new name of Bangladesh. He photographs the refugee camps on both sides of the border and warns Indira Gandhi, Prime minister of the Republic of India, of the violence of these confrontations. 1973 Marc Riboud travels to the United States to cover the Watergate hearings involving an incident of political espionage that would ultimately result in the resignation of American President Richard Nixon. 1979 Covering Iran during the Islamic revolution. Marc Riboud photographs the delirious crowds celebrating the return of the Ayatollah Khomeini. The same year, he takes photos of the occupation of the United States embassy and the sequestration of its personnel. On November 4th, 1979, the United Stated embassy in Tehran is attacked by Iranian students and 52 Americans are taken hostage in protest against the hospitalization of the Shah in the United States. In 1980, after the moderates are eliminated, Iran is declared an Islamic state and grants Khomeini full power. Marc Riboud resigns from Magnum, retaining the bonds of friendship he has established there. 1980-1981 Marc Riboud produces a long story in Poland, as the entire country joins forces in support of Solidarnosc. He visits Prague regularly in support of his friend Anna Farova, photography historian and one of the first to sign Charter 77, which calls on the Czech government to honor its commitment to respect human rights. 1987 Marc Riboud photographs the trial of Klaus Barbie, Gestapo chief of Lyon between 1942 and 1944, convicted of crimes against humanity. 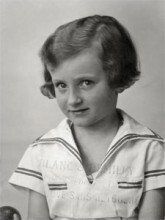 His photos of the trial and of the Maison des Enfants at Izieu illustrate an article published in Libération and Le Nouvel Observateur and a book by Catherine Chaine, Le voyage sans retour des enfants d’Izieu [The Voyage of No Return of the Children of Izieu], published by Gallimard Jeunesse. 1986-1991 At the advice of his friend, the painter Zao Wu-Ki, Marc Riboud makes several trips to Huang Shan, the “Yellow Mountain” of Chinese painters. He also returns to Cambodia many times to photograph pilgrimages and temples at Angkor. These photos are collected and presented in two books: Capital of Heaven and Angkor, the Serenity of Buddhism. Thousands of students, intellectuals, and workers gather at Tiananmen Square in Peking to denounce corruption and demand political reforms. After over a month of demonstrations and hunger strikes, which spread to other cities in the country, the Chinese government sends in the army, causing many civilian casualties. 1992-2003 Marc Riboud continues to visit China regularly, photographing its spectacular metamorphoses. His friend, publisher Robert Delpire, combines these photos in the books In China and Shanghai Tomorrow. 1998 A few years after the end of apartheid and the election of Nelson Mandela, Marc Riboud covered several stories in South Africa. He photographed Johannesburg and Soweto township as well as remote villages. 2001 Marc Riboud is in New York for the opening of an exhibition, and to receive a Lifetime Achievement Award from Leica, when the attacks of September 11th occur. He photographs them live on the television of his hotel room. 2002 Marc Riboud continues to travel, to take pictures or to accompany his exhibitions. For two consecutive years he participates in the festival of Pingyao, organized by Alain Jullien, the first and short-lived “open” gathering of photographers in China. Following the attacks of September 11th, 2001, and accusations of the detention of weapons of mass destruction by the regime of Saddam Hussein, American president George W. Bush builds a coalition to go to war against Iraq. The invasion leads to the swift defeat of the Iraqi army, but militias, insurgent groups, or members of Al Qaeda continue the bloody struggle throughout the country after American troops pull out in 2011. Accompanied by the “Young Girl with a Flower”, whom he had located a few years earlier, Marc Riboud goes to London to participate in demonstrations against the war in Iraq. 2008 Marc Riboud follows with interest the American presidential elections and travels to the United States to witness Barack Obama’s inauguration as the first black American president. 2010 Marc Riboud travels to China for an exhibition at the Shanghai Museum of Fine Arts, taking advantage of the trip to do a last photographic story on this city he has loved for the past sixty years. 2011 Marc Riboud makes a dation to the National Museum of Modern Art, Centre Georges Pompidou: 192 original prints, chosen among his finest photographs of the 1950s and 1960s, join the museum’s permanent collections. 2012 In the book Into the Orient, Marc Riboud assembles photos of the great voyage of his youth, from Turkey to India, then to China and Japan. The book, published by Xavier Barral, is awarded the Prix Nadar.